When it comes to hair, we're all about embracing what you got. 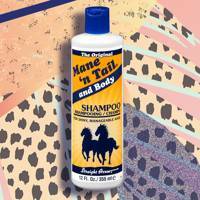 Whether it's fine hair, straight hair, or hair so curly you could bounce a coin off it, you should feel blessed by whatever your mane game is. But it's also SO natural to want what you don't have (damn you, grass-is-greener syndrome), which is why keratin treatments, wigs and styling tools were created for those who find their frizz more foe than friend. Frizz can be caused by so many different things, from humidity to the wrong hair cut, and dry or damaged hair. And one thing that can exacerbate the latter, is over-cleansing. Particularly with fine hair that's prone to flyaways. If you're looking for a smoother finish post-wash, "Make sure you only shampoo light, do not vigorously rub the hair and finish with a cool water rinse after your conditioner," says Antony Rawlings, Creative Director at Lockonego for Redken. He also recommends adding a mask into your routine once a week (or more often if you have a course or curly hair type). 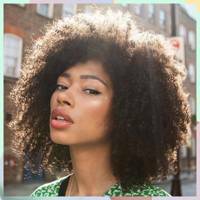 A huge debate when it comes to frizz is whether blow-drying or air-drying gives smoother results, and the answer usually varies from person to person. Larry King is team blow-dry, recommending those with frizz to "use a smoothing nozzle on your hairdryer and always finish with the cool shot to smooth down the cuticle. Invest in some great products to help; adding before you start your blow-dry will make a real difference to how long it lasts." If you prefer to air-dry, Antony says to style the hair while it's still wet so that it dries smooth, rather than trying to shape it once it's dry. Or rather, try not to brush it too much. 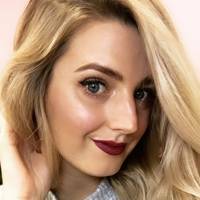 "Overbrushing can damage the ends and cause them to frizz", says Larry, who recommends a round brush for when you do use one, so that "you’ll have more control over the ends and can get in tighter to the root to smooth." If your hair starts to go frizzy halfway through the day, Larry says to reach for the hairdryer rather than a brush. "You can run the hair dryer back over your hair during the day. It doesn’t have to be wet to smooth it over, just add a little smoothing product and re-smooth using your round brush and hairdryer. I love the (£299) because it doesn’t cause heat damage, so you don’t have to panic about going back over it again." 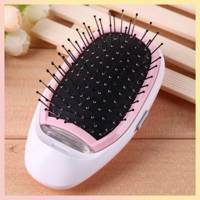 As for the bristles of your brush, Antony recommends going for boar bristles to prevent breakage and defrizz. Try the Denman Pro-Tip Boar Bristle Round Wooden Brush (£12.99 from ). 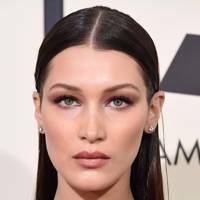 Ever tried smoothing your frizz with a serum and ended up looking like a grease monkey? Larry advises: "distribute the product thoroughly through your hands first, then start at the back of your hair and apply to underneath, leaving that final top layer til last." This way you'll only be using the smallest amount of residue. 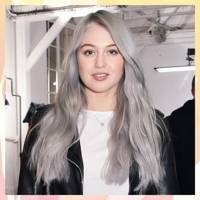 Antony also recommends trying the new , "because it's light and in a mist form, so it smoothes flyaways and static without weighing hair down." And if you're heading out on a particularly humid day, he says to follow your serum with a humidity spray on top. "But always spray on to a brush and then brush through the hair instead of spraying directly on top." 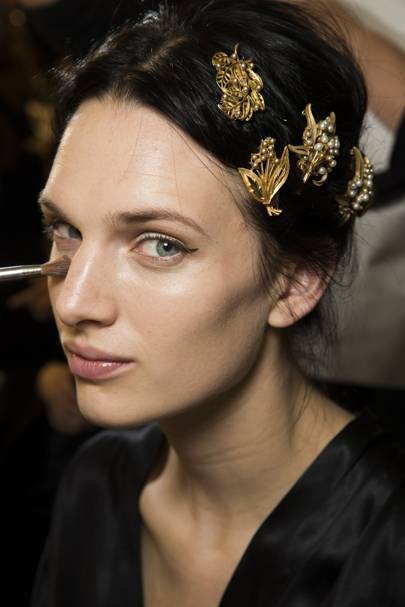 An accessorised up-do is a great choice for humid days. Not only will the pretty clips keep frizz locked down (and look lovely) - they'll prove a great distraction from any flyaways. 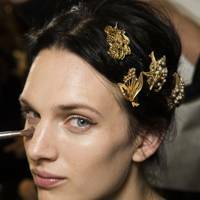 If Chanel say it's OK to start wearing headbands again, then it's OK. A loose up-do will disguise frizz while the band will keep tresses locked-down. Slick side-swept ponytails are big for this season; use this Dior look as your style guide and be free and easy with the hairspray to keep frizz at bay. A textured French braid is perfect for humid days; add plenty of root lift spray before you style and finish with a spritz of firm hold hairspray to fight flyaways. This super-messy Fendi twist will only look better when humidity strikes; spritz hair through with salt spray before styling to give a controlled textured finish. Tightly-wound double French braids are pretty much weather-proof. Come on humidity; do your worst. Be sure to apply a mousse or salt spray through locks before styling for extra hold. 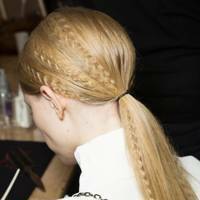 Confuse frizz-prone hair by adding extra texture in the form of crimped sections swept back into a low ponytail. This way the added volume and frizz will look deliberate. 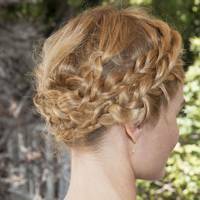 A loose, multi-strand halo braid is messy enough to look even better once the humidity adds a little extra texture to your locks. 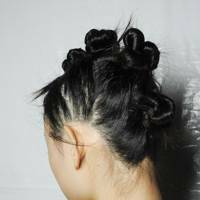 Shorter hairs are those most likely to be affected by frizz in the humidity, so keep all your hair locked down with a multi-bun up-do like this catwalk style. 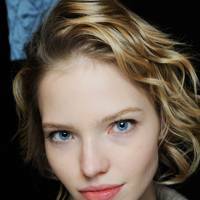 Wet-look hair is a top trend for summer 2015, and humid weather is the perfect time to tap into it. Add a gel-spray product through the upper lengths of locks and when wet, slick back behind your ears and finish with a holding spray. If you're blessed with natural waves or curls, the chances are the humidity is causing you no end of stress. But embrace the extra volume this weather affords; style your curls as normal and finish with a nourishing hair oil to lock in moisture. 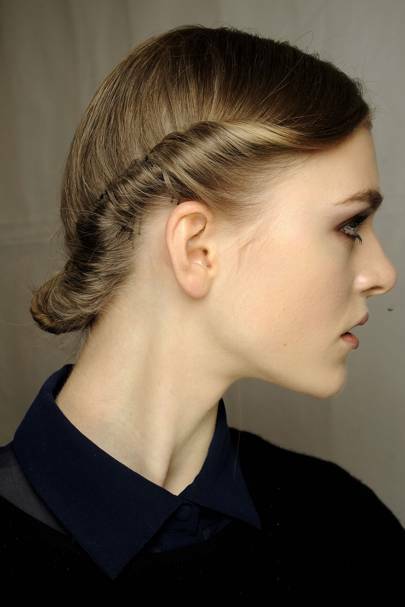 Divide your hair into two sections and twist back from the temples, adding in hair the lower you get. 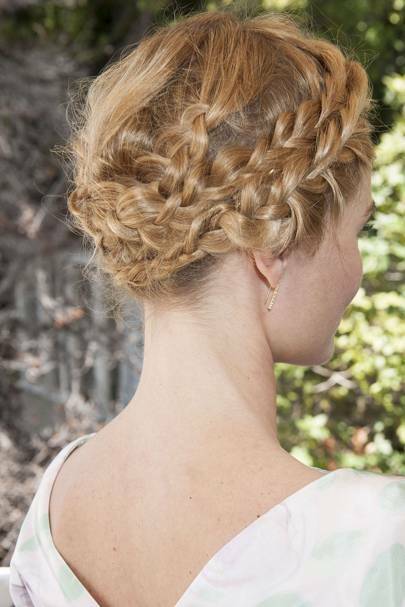 When both twists meet, pin into a bun and secure with plenty of pins down each side. Carry a pocket full of bobby pins for when the humidity strikes. Nothing will keep your locks in place quite as well as a hair net; and lucky for you this sleek ballet bun is on trend for the summer. Pull hair back into a tight high ponytail and spray into place before twisting hair into a bun and pinning it securely with a net. A summery topknot is perfect for when frizz levels are high. 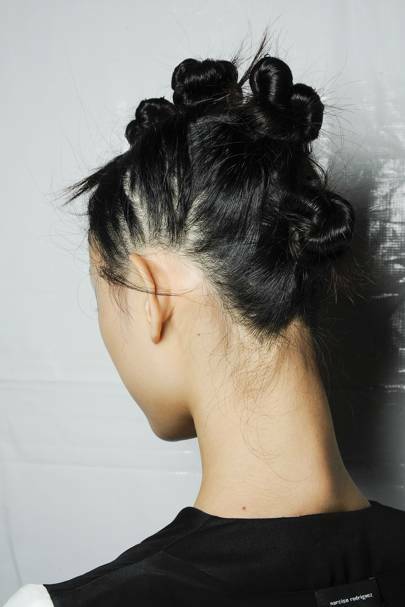 Just scoop your locks into a high pony and twist locks into a high bun, letting the knot peek over your head. Flyaways will just add to the relaxed summer vibe of this look. If you'd rather not sweep your hair back into an up-do as the frizz-factor raises, opt for beachy tousled tresses that will look better with a little extra volume. Spritz locks with salt spray and carry it with you to touch up throughout the day. 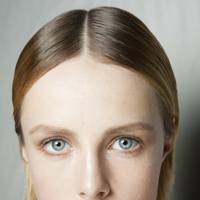 Using serums, oils and glosses in humid conditions is always a good idea. 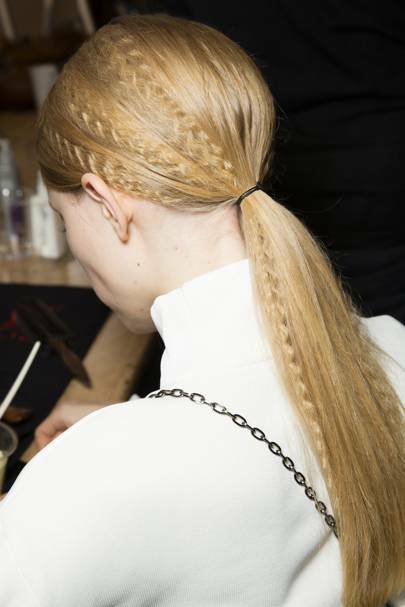 Slick back your locks and keep it simple with a centre parting for a frizz-free mane.